To report the radiological predictors of kyphotic deformity in osteoporotic vertebral compression fractures (OVCF). This is a retrospective study of 64 consecutive patients with OVCF. We studied the radiographic features in the immediate post-injury image of patients, who developed significant (more than 30°) segmental kyphotic deformity at final follow-up and compared them with those patients who did not. 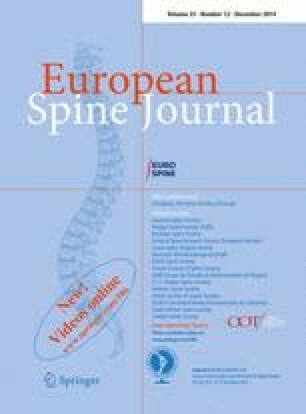 Thirty-three (82.5 %) out of 40 patients with fracture at thoracolumbar (TL) junction, 5 (33.3 %) patients out of 15 with fracture at lumbar (L) spine and 7 (77.7 %) patients out of 9 with fracture at thoracic (T) spine developed significant segmental kyphotic deformity. Forty-one (75.9 %) [TL-33 (80.5 %), L-4 (33.33 %) and T-4 (80 %)] out of 54 [TL-37 (68.51 %), L-12 (22.23 %) and T-5 (9.26 %)] patients with superior endplate fracture developed significant segmental kyphotic deformity. Forty patients (86.9 %) [TL-28 (70 %), L-6 (15 %) and T-6 (15 %)] out of 46 [TL-32 (69.56 %), L-8 (17.4 %) and T-6 (13.04 %)] with anterior cortical wall fracture developed significant segmental kyphotic deformity. Five patients (71.42 %) [TL-2 (40 %) and T-3 (60 %)] out of 7 [TL-02 (28.58 %), L-01 (14.28 %), T-04 (57.14 %)] with adjacent level fracture developed significant segmental kyphotic deformity. The average immediate post-injury kyphosis of 11° (5°–25°) increased to 29° (15°–50°) at final follow-up. Progressive segmental kyphotic collapse following an OVCF seems unavoidable. Patients with TL junction and superior endplate fracture are probably at the highest risk for significant segmental kyphotic deformity.